UNM-Gallup Visiting Assistant Professor Kristi Wilson and two of her students recently attended the annual Society of North American Goldsmiths (SNAG) Conference in Asheville, N.C. and brought home a wealth of information, education and memories. Wilson was accompanied by Sharmayne Arviso and Jade Hustito who were both students in her Small Metals Construction class. The three participated in lectures, demonstrations, exhibits and social networking events in the field of contemporary jewelry making. SNAG supports and advances the professional practice of jewelry designers, artists and metalsmiths. The first SNAG conference was held in 1970 with the intent of creating an organization dedicated to these professionals and their art. A keynote speakers at this year’s event was Gary Noffke of the University of Georgia who is a master metalsmith and instructor with over 30 years of experience in the field. 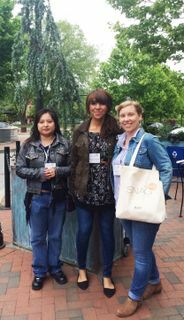 UNM-Gallup students Jade Hustito and Sharmayne Arviso and Professor Kristi Wilson attended the 2016 Society of North American Goldsmiths Conference in Asheville, N.C. Already in possession of an associate’s degree in Design and Digital Media, Hustito is pursuing a second degree in Information Technology, but hopes to continue gaining skills in small metals construction. Professor Wilson was impressed with the popularity of southwestern styles in jewelry-making. The trip was sponsored by the UNM-Gallup Faculty Professional Development Committee as well as Student Senate.